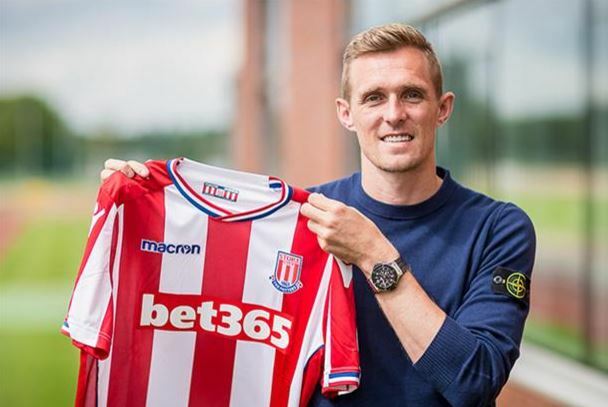 Stoke City has officially unveiled veteran midfielder Darren Fletcher as their first signing of the summer, with the West Brom midfielder joining on a two-year-deal. The 33-year-old former Manchester United star has been an ever-present for West Brom in their last two Premier League campaigns. However, with his contract expiring, the Scottish international has decided to swap the Hawthorns for the bet365 Stadium. Fletcher had apparently been offered a new contract by Tony Pulis, but the four-time Premier League champion has instead chosen to join up with Man Utd legend Mark Hughes at Stoke. It’s all happened incredibly quickly, but I am delighted to be here. This is a fantastic Club with a top manager and a great group of players and I am really looking forward to this opportunity. I loved every moment of my time at West Bromwich Albion and I loved every moment of my time with Manchester United, but this is a new challenge for me now, and I like to think I respond well to new challenges. Despite his advancing years, Fletcher’s consistency and lack of injuries are rather impressive, while his experience will surely be a boost to Stoke both on and off the pitch. Stoke themselves have rather stalled in recent seasons, despite the influx of a lot of gifted players, with a 13th place finish in 2016/17 a significant underachievement. However, the likely signing of Fletcher seems like a very shrewd move for the Potters. And that’s yet another UCL winner in Stoke squad.